Now that the protagonist and BFF have been cast for the Boy Meets World spinoff, what other archetypes should we expect to see in 'Girl Meets World'? Plus the latest on which characters from the original series might be returning. Actress Sabrina Carpenter has been tapped to play the role of 'Maya Fox' on Girl Meets World, the upcoming Boy Meets World spinoff. In the wake of Monday’s casting news regarding Riley Matthews, the protagonist of the coming sequel to the much-beloved (at least by us) 90s sitcom Boy Meets World, more revelations about the series have been coming fast and furious. Last night, Entertainment Weekly reported that the role of Maya Fox, Riley’s best friend, had been cast as well. Also, it was reported that producers have leaked details about three other supporting characters: older brother Elliott Mathews and likely classmates Tristan Friar and Shamus Farkle. First off, those are some fantastic names—clearly something for which creator Michael Jacobs has an uncanny knack (see also: Lawrence, Topanga and Minkus, Stuart). Secondly, the descriptions of these characters seem rather… familiar. In fact, there’s plenty of direct parallels between these new seventh-graders and their Boy Meets World predecessors. Shawn Hunter (Rider Strong) began Boy Meets World as an only child (before discovering he had a long-lost half-brother in his senior year of high school). He also had a notoriously complicated relationship with his father, which is why Cory and his parents quickly became Shawn’s surrogate family. And the other characteristics ascribed to Maya closely mirror Shawn’s: “wonderful student of life” (21st-century Disney-speak for “street-smart”), popular, rebellious and loyal. In fact, it would actually be surprising if Maya didn’t turn out to be Shawn’s daughter at some point during the series’ run—a revelation made more likely by the fact that Jacobs recently stated that Strong would likely be part of the spinoff. Cory and Topanga’s son. This guy will start the series as a “thinking man’s jock.” He’s described as “good looking, well built, funny and insightful in his observations. Good hearted except for his dedication toward using Riley (Blanchard) as his wrestling practice dummy. His parents worry that he has inherited the ‘Eric Matthews Algernon’ gene and will lose intelligence as time goes by.” That “Eric Matthews Algernon” bit is a two-part reference to a character in the original series who got dumber as seasons passed and the classic novel with a similar theme, Flowers for Algernon. “Good looking, well built, funny and insightful” pretty much hits the nail on the head for the Eric Matthews (Will Friedle) from BMW‘s first few seasons (though you’d be remiss not too mention “a phenomenal head of hair“). Though Eric wasn’t a jock, he was certainly portrayed as popular, so that should like up pretty well. Also, the fact that they’re already discussing the ‘Eric Matthews Algernon’ gene for Elliot is fantastic and that particular turn of phrase should certainly be employed on GMW. Frequently. Austin may be a little far away from Philly (the setting for BMW and, presumably, GMW), but the principle is the same: Tristan is an outsider because he’s a “cowboy;” Topanga (Danielle Fishel), a recent transplant from Pittsburgh, was an outsider because of her over-the-top spirituality. In fact, Cory was fond of calling Topanga an actual alien—though it seems the producers have decided to make Riley somewhat more tolerant than her father/predecessor. Throughout high school, Topanga was consistently out of Cory’s league, especially in the looks department, but that seemed to work out for both parties in the end. This may be the biggest departure from BMW‘s initial archetype. “Future world leader” and “nemesis” absolutely scream Stuart Minkus, but the fact that Shamus is close with Riley and actually cares for both her and Maya distinguishes him from Minkus. In the first season of BMW, Cory and Shawn tormented Minkus (and Topanga) relentlessly, but this particular love-hate relationship triangle seems to be based more on the former than the latter. Plus the description of the Maya-Shamus relationship seems primed for sparks somewhere down the line, perhaps when GMW hits the high school years (assuming, of course, Shamus doesn’t disappear after just one season like Minkus did). The other major development of the week came in show creator Jacobs’ interview with the Hollywood Reporter, where he revealed that Friedle said, “I will be at every taping.” Let’s all hope that means in front of the camera, and ideally in every single scene. 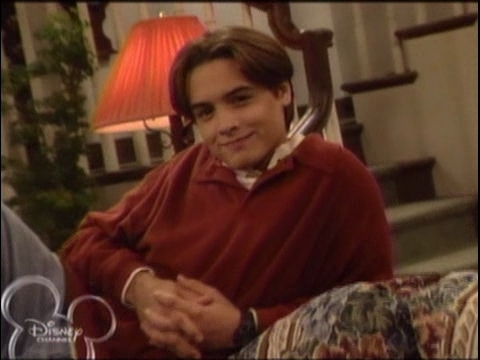 It’s important to never forget that Eric Matthews is the best.